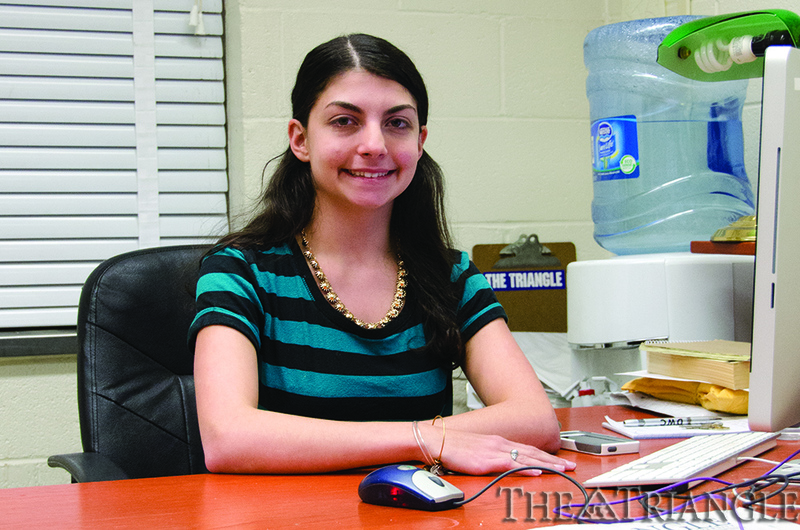 Pre-junior English major Julia Casciato is taking over as The Triangle’s editor-in-chief for the spring and summer terms. Casciato has been involved in The Triangle since coming to Drexel with high school classmate and former Editor-in-Chief Sandra Petri, a pre-junior business major for whom Casciato will be taking over. “We both decided that Drexel was where we wanted to be, and we knew that we wanted to be involved in the newspaper. So, first Monday of the term, we went to the staff meeting and we started right away ,” Casciato said. According to Casciato, she was originally interested in Drexel because of its renowned engineering program but then realized her passions lay elsewhere. “I decided to major in English because I’m really passionate about reading and writing, but you can’t necessarily just like to read to get the job done, and you can’t just like to write to get the job done. You have to be really passionate and you have to really care about what you’re doing,” she said. It wasn’t until Professor Raymond Brebach noticed an article of hers in the Philadelphia Inquirer and sent her an email that she officially decided to attend Drexel to pursue a degree in English with a minor in marketing. Since beginning as a staff writer at The Triangle, Casciato has served as assistant news editor and news editor and was awarded the “Editor-in-Chief” award by fall and winter 2012 Editor-In-Chief Helen Nowotnik. Nowotnik explained that Casciato was very deserving of the only award that requires no consultations from other leaders within The Triangle. Casciato explained that she is ready to begin her new position. “I am really excited. I feel like I’ve put in a lot of hard work the last three years here. I’m really passionate about what we do because I think it’s really important to keep the community informed about what’s going on with Drexel,” she said. Casciato also expressed excitement for working more hands-on with all of the staff members to generate ideas to improve the paper. Her overarching goal as editor-in-chief is to make The Triangle more accessible and helpful to the Drexel community. “A lot of what I want to do is expand the paper in a way where we’re almost like a ‘one-stop shop’ for the Drexel community. Anything you want, anything you need, Drexel-related, you can come [to] us; you don’t need to go to a million different Facebook pages. We want everyone to be able to come to thetriangle.org and just know what’s going on,” she said, and has already begun working with colleagues to get projects in motion. With added responsibilities, however, Casciato recognizes there will be added challenges. “I think a big challenge is going to be finding the perfect balance between work and school and the paper. In the past, I thought of the paper as a part-time job in the number of hours I’ve worked, and now I expect to put even more time in,” she said. Another challenge Casciato will face is funding. “We’re independently funded; we don’t get any funds from Drexel, so it’s really important that we are putting out good products [for] our customers, but we also need to be benefitting from it,” she said. Petri, who also served as both news editor and assistant news editor before ascending to editor-in-chief, explained some of the biggest differences between the roles. “As [a] section editor, you’re much more connected with the details. You have control over things on a small level, and as editor-in-chief you are a bit disconnected and have to really trust your staff to take care of the smaller things so you can take care of the bigger things,” Petri said. Outside of The Triangle, Julia enjoys spending time with her friends and family, especially trying new eateries. She has worked as a peer reader at The Drexel Writing Center, where she did her first co-op serving as the Operations Manager. For her second, she worked at the Comcast Corporation as a communications intern in the National Engineering and Technical Operations department. She is also a recent fan of “House of Cards” and a long-term fan of the Phillies. “I love baseball and have my entire life,” she said, and has even organized an effort to have The Triangle staff attend the Phillies’ College Media Night April 29.